The kiddos are no strangers to Play-Doh and they all love to play with soft squishy stuff. Especially Steffi, whose obsessive love for slime resulted in a very unfortunate incident due to it. While they are contented with making odd shapes out of the doh and mixing the colors up despite my pointless attempt at separating the colors at the end of the their play. But Play-Doh has now taken it a step further, but incorporating technology into play. 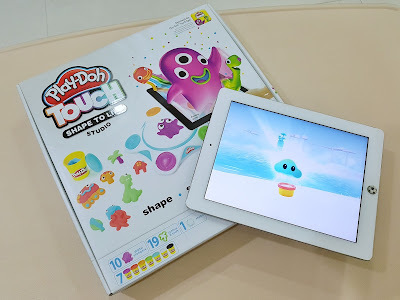 To be honest, this is nothing revolutionary, since technology is already touching every aspect of our lives these days, but I must admit that the downloading the free Play-Doh Touch app from Apple Store or Google Play added a whole dimension to Doh play, even for adults like me! 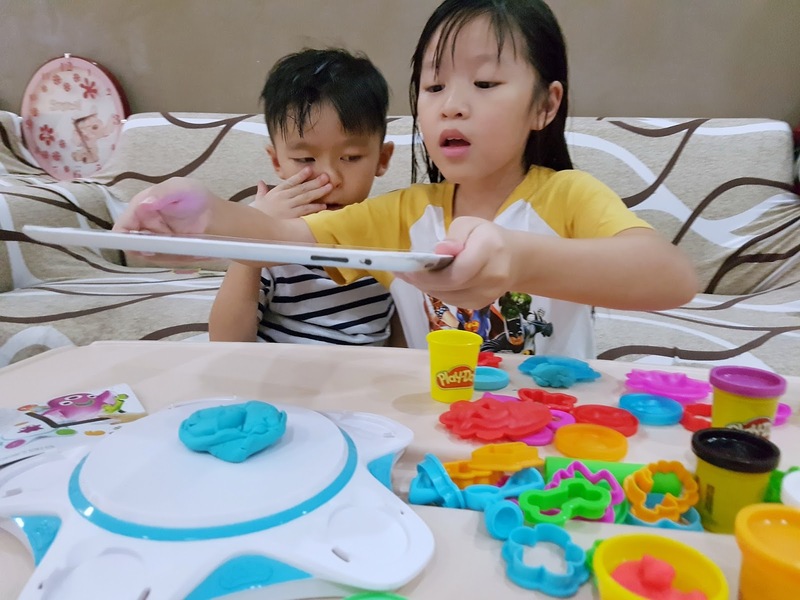 The Play-Doh Touch Shape To Life Studio set ($39.90) comprises of 7 tubs of Doh, 10 digital stampers (moulds), 19 cutters and tools, as well as one studio (base plate), but the magic, is really the app itself. WIth the kiddos' imagination and creativity (or even the lack of it), all that is needed to turn their creation to life is a simple scan with it in the middle of the studio. It was magical and we were amazed the first time we tried it! The creature appeared in the app, exactly the way imagined and modelled, and in an almost 3D form! And as long as the creation resembled any lifeform with appendages, the creature will also move in a fluid movement, with legs moving or tails swaying! Gameplay was simple and the whole fun was seeing the creature one created, come to life and moving around. One do however need to hold the device quite high to capture the doh and that may prove to be a little difficult for the younger ones. Steffi got to stand up (after this photo was shot) to be able to capture her creation. The blob can actually move like a living being! 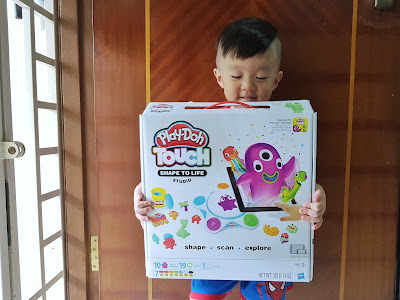 Hasbro wouldn't like me for saying this, but you don't exactly need to buy the Play-Doh Touch Shape To Life Studio (which you can order here btw). 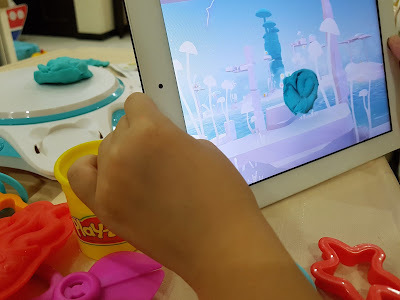 You see, the app does not discriminate between Play-Doh, plasticine or even a blob of bluetack and will still bring any darn thing in any white background to life in the app. 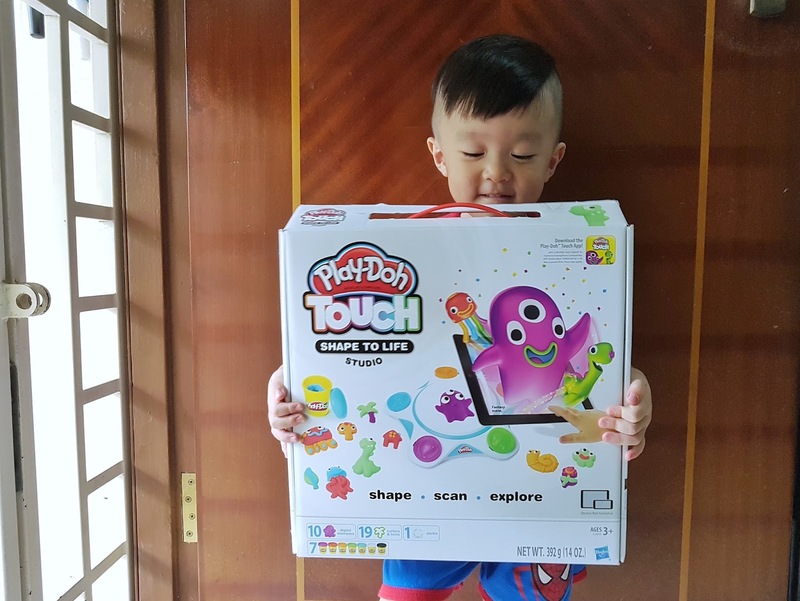 Having said that, this would make a perfect gift for IT-savvy kiddos, and encourage some physical play instead of only all screentime. Thank you Hasbro for sending the kiddos your love! Another Eye (DCS-936L) So That I Can See Better! Singapore, A Great Place For Families?